At the beginning of school and after each school break, teachers teach and review procedures for appropriate behaviors throughout the school. Students observed "doing the right thing" by adults in the building are randomly issued written High Fives! 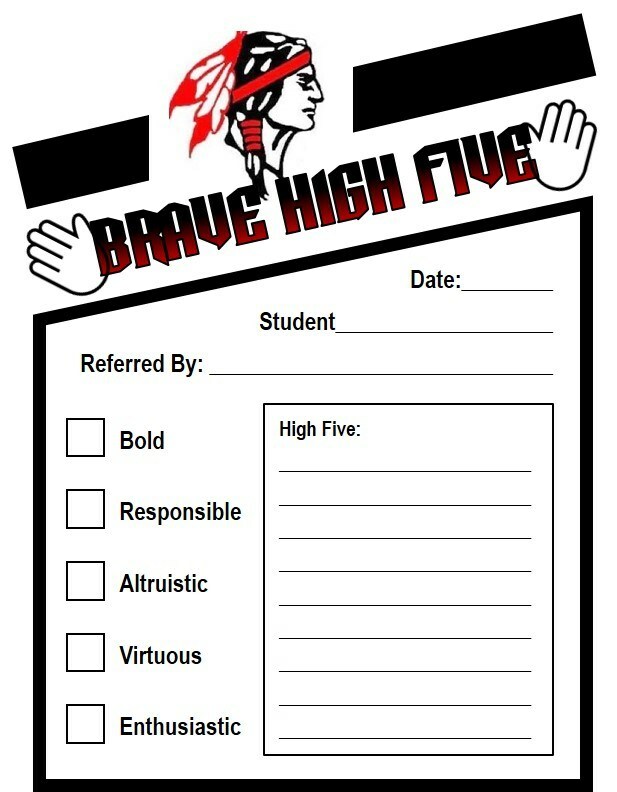 High Fives are printed in triplicate so that students have a copy to show parents. We have found that many of our students treasure the High Fives alone as they tape them inside their lockers and in their notebooks. However, eight times each school year, we hold High Five assemblies. During this time, 25 High Fives are randomly selected, and prizes are issued to those students. Our prizes range from Kindle Fires to gift cards to lunch with the principal. Minimum or recommended consequences are set forth with these policies. When the circumstances of the violation warrant, after taking into account any relevant information, the school administration has the right to assess an alternative consequence. Parents will always be notified in the event of a Level Two or Level Three offense. 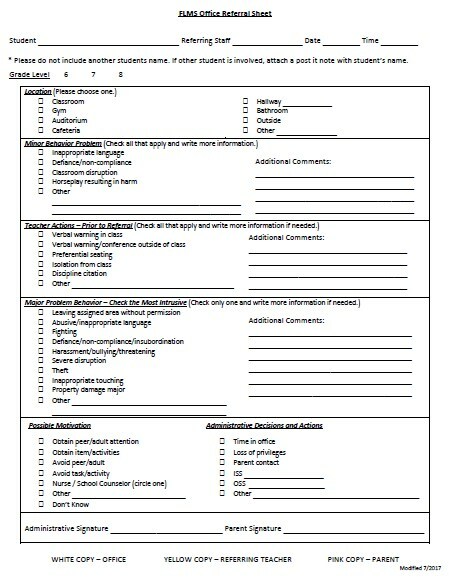 All Level One offenses will be handled at the classroom level by utilizing a citation system. Citations will reset to zero at midterm (4 ½ weeks) and at the beginning of each new grading period. Misbehavior for a substitute teacher may result in In-School Suspension. Citations are entered into Skyward. 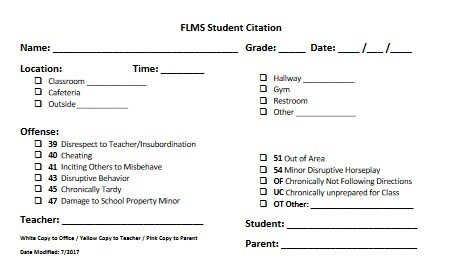 The accumulation of 2 citations for similar offenses will result in an office referral. SATURDAY SCHOOL: Students may be assigned Saturday School rather than in-school suspension. This will help keep the students in class while continuing their education. Saturday School will opperate from 8:00-12:00 once a month. Two hours will be spent on academics, and two hours will be spent completing service projects on campus. Parents must drop-off students promptly at 8:00 and pick them up no later than 12:00. Those who do not show up for assigned Saturday School will be given out of school suspension. SMOKING AND TOBACCO USE: Smoking and/ or use of tobacco products by Fort Loudoun Middle School students is prohibited any time they are under the supervision of the school, including while on school buses, at athletic events, or anywhere on the school grounds. Students are not permitted to bring tobacco products to school. Students who violate this policy may be subject to immediate suspension, change of school program, or possible expulsion. These actions may include the involvement of law enforcement officials and the juvenile court system. Prevention programs on this topic will be presented throughout the school year. Violation of this policy will automatically result in a 3-day suspension and a juvenile petition will be written. WEAPONS & DANGEROUS INSTRUMENTS: Students shall not possess, handle, transmit, use or attempt to use any dangerous weapon in school buildings or on school grounds at any time, or in school vehicles and/or buses or off the school grounds at a school sponsored activity, function or event. Dangerous weapons for the purposes of this policy shall include, but are not limited to a firearm or anything manifestly designed, made or adapted for the purpose of inflicting death or serious bodily injury or anything that in the manner of its use or intended use is capable of causing death or serious bodily injury. Violators of this section shall be subject to suspension and/or expulsion from school. FIREARMS POLICY: In accordance with state law, any student who brings or possess a firearm on school property shall be expelled for a period of not less than one (1) calendar year. The director of schools shall have the authority to modify this expulsion requirement on a case-by-case basis. DRUGS POLICY: In accordance with state law, any student who unlawfully possesses any drug including any controlled substance or legend drug shall be expelled for a period of not less than one (1) calendar year. The director of schools shall have the authority to modify this expulsion requirement on a case-by-case basis. BATTERY: In accordance with state law, any student who commits battery upon any teacher, principal administrator, any other employee of the school or school resource officer shall be expelled for a period of not less than one (1) calendar year. The director of schools shall have the authority to modify this expulsion requirement on a case-by-case basis. BULLYING / TEASING / HARASSMENT: Fort Loudoun has an obligation to and is committed to providing a safe learning environment for each of its students. Student achievement is best attained in an atmosphere that is free from the fear of emotional and physical intimidations and threats. Bullying is a destructive behavior that will erode the foundational principles on which a school is built. This school will not tolerate any behavior that is classified under the definition of bullying and will take steps needed to eliminate such behavior.